Whether it's being relaxed, having a positive attitude or improving your technique, being a better game shot is something we should all strive for. So far this season I have shot on a number of days at home and abroad and, working as a shooting instructor, helped some very interesting people with some very intriguing shooting problems. I have had a couple of excellent outings and one that I would much rather forget – a day when everything seemed to be cursed. Be in no doubt, even when you teach shooting and write about it, things can still go wrong. One of the beauties of our great sport is that it is not entirely predictable. You can put the odds in your favour with preparation and practice, but anyone who says they never miss has a very long nose. Even experienced shots can have a bad day and, when it comes, it is important not to lose your confidence. Accept your humanity and continue steadily on with a smile. That said, I do not suggest you ignore any protracted spate of missing. If missing becomes a habit, something needs to be done. Happily, most of us can become much more consistent shots with just a bit of effort. The truth is no one likes to miss too often and nor is it fair to our quarry to shoot less than cleanly. So here are the five things I think you need to do to be a better game shot. Some may appear obvious. Some, hopefully, will promote thought. Some may require a significant but worthwhile investment in time and effort. This tops the list because nothing, safety apart, is more important. Those who shoot well demonstrate it, those who don’t rarely do. Shooting requires one to be in a paradoxical state of what might be called relaxed concentration. According to psychologists, you need to be ‘aroused’ but not too hyped up to do your best work in most sporting tasks. It is possible to fall off the cliff if you let yourself get overly agitated, which will not only disrupt your cognitive processes and vision, particularly focus, but lead to increased muscular tension. Without some fire in the belly, though, you will not perform at your best either. You must discover how to get in your zone. Towards this, developing your natural hunting instincts can be helpful. This primal stuff is not much spoken about, but is important. The best shots have fun, but they have a steely determination when required, something of the predator’s killer instinct if they are really good, and, notably, refined field senses: namely an acute visual and sensory awareness of their environment and quarry. Do not take this as promoting indiscriminate slaughter. We all abhor ‘poultry’ shooting and admire those who pick their birds. But as well as being able to relax, you need to be able to switch on the ‘I am going to shoot that bird because I need it’ attitude. When you shoot really well you may seem to have ‘a different head on’. There is a little bit of Zen to it: intention and result are connected. Sometimes, when one is not doing well, it is as if you have become disconnected and the best response is to reconnect by concentrating on focus. Thus, if one were to sum up all this with one word, it would be connection. Be at ease when it is appropriate but as you prepare to shoot: connect, focus, and lock-on. There must be nothing between you and the bird. When you have shot your mark, shoot another, or stand down and wait in that semi-relaxed but clear state until it is time to focus again. Recognise and befriend your inner hunter. The club may have been replaced by a snazzy shotgun, but the principles and feeling, not least the awe and satisfaction of being successful, remain the same. Shooting well requires confidence based in the knowledge that you know you can do it and have practised toward perfection. You should not step onto a peg without having honed the basics of your technique to the point that it has all become intuitive. Under pressure then, you will default to the right thing, not chaos. You should, of course, have learnt how to stand well and how to move the feet when required so you maximise your balance as you pull the trigger. I like to have my rear foot at about 90 degrees to the point where I take the shot. Your mount and swing should be perfected – fluent, rhythmic and unrushed. Smoothness is the order of the day. You must achieve and sustain perfect focus on every shot, developing a visual strategy, such as looking for the bird’s head. You should be aware of both lead (forward allowance) and line. These skills can be practised at a clay ground pre- and mid-season, and also by shooting pigeons, something every game shooter should try because so much is on offer, not least a huge variety of shots and wonderful, relaxed days. Generally, the over-under user, unless facing a pure driven shot coming straight forwards or nearly so, will endeavour to keep barrels perpendicular to the line of the bird (the side-by-sider, parallel). Another way to think of it is that when you are not tackling the straight – or nearly straight – incoming bird, your shoulders should be parallel to the bird’s line. Don’t forget to smell the flowers and enjoy every part of your shooting day. On the subject of forward allowance, most simply do not realise the vast range of leads required with different birds. I generally advocate the ‘swing-through’ system or, at closer ranges, pointing at the bird (or its tail feathers) and pushing forward. For tall birds, starting behind the bird roughly as far as you intend to go in front works well. I now call this ‘graduated swing-through’. So-called maintained lead has its uses too – notably when wildfowling – provided one does not become too deliberate at the cost of fluency and follow through (it is not the best of techniques for those with eye issues). If any of the above raises any doubts whatsoever, the sensible thing to do is book a lesson at a good shooting school. A lot of game shooters would benefit from spring and summer clay shooting too. Putting your gun away at the end of the game season and not touching it again is not a recipe for consistent performance. 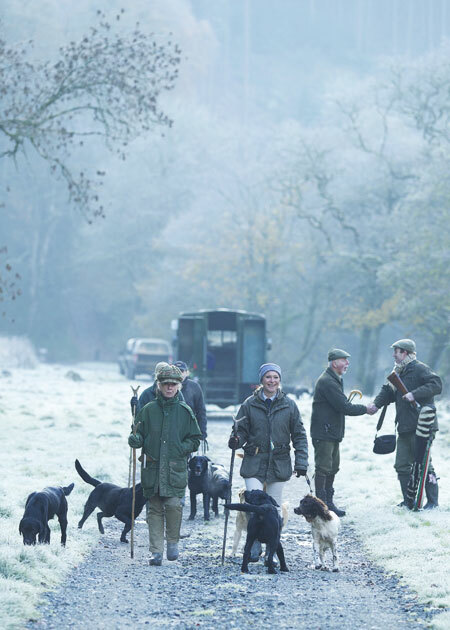 Put cartridges through your gun all year round. The importance of confidence in all things cannot be over-stated. Without it, you will be hesitant and your physical actions will be directly affected, possibly causing you to stop and miss behind, among other things. We have discussed technique briefly, but equipment is important too. One must not get obsessive but you do need a gun, choke and cartridge combination that works for you. To this end, I think we should all test our gun at a pattern plate at least once. This will reveal where a gun is shooting for you, perhaps highlighting problems of gunfit and eye-dominance. It will check the regulation of the gun, providing feedback on pattern, and it will give you an awareness of the pattern your gun throws with any particular choke/cartridge combination. The gun itself must not only fit, it must be suited to the task. This is not the place to consider the merits of over-unders and side-by-sides, bar perhaps to note that the former tend to have superior pointing and recoil control qualities, and the latter are not only typically lighter but easier to reload. I use both. In recent years 20-bores have become more popular, especially those with longer barrels. The reason may be that a mass-produced 20 with 30” barrels mimics and possibly improves upon the handling qualities of a best, bench-made 28” side-by-side. If one was to look for the gun that maximised advantage, I believe for most it would be a 28 or 30” 12-bore over-under with a bit of, but not too much, choke. With regard to cartridges, I think going up a pellet size may help to pull down more birds cleanly, and standardising on one load to use for most purposes helps (in my case 30 or 32 gram felt-wad 5s). Always strive to keep it simple, all energies on the bird. What about choke? The first few thou makes a very significant difference, beyond that it is personal preference (though very tight constrictions may blow patterns). So improved and half for general shooting, half and three-quarters, or three-quarters and three-quarters for high birds would be my call. I am amazed by how many shooters unknowingly have eye-dominance issues. It is essential not only that you know your own eye-dominance but that, assuming you shoot with both eyes open, you have it tested annually or biannually. Changes in eye-dominance can sneak up and cause havoc to consistent shooting. I often meet people who are continually shooting a foot or more to the side of their mark without realising it. When you show them this on clay targets or at a pattern plate, they are stunned. It is also important to have your eyes tested regularly for visual acuity, the critical thing being your ability to focus on objects at range with natural or corrected vision. An annual visit to the optician will act as something of a general health check too and can show up serious conditions such as diabetes, glaucoma and high blood pressure. If you have an eye test, I recommend you spend the small amount extra on a digital retinal photograph. Understanding your vision and using it well are fundamental to being a better game shot. Continuing with our simple-as-possible theme. You must not only focus on every bird, you must stay focused on every bird throughout the shot, resisting the temptation to let the eye or eyes come back to the gun. If you do this you will unlock your extraordinary natural hand-to-eye co-ordination. And these are abilities that are much cleverer than anything you might consciously think your way to. Stare every bird to death. I think this is too often forgotten.One must be remember to enjoy and fully appreciate the day in all its aspects. The privilege of attending a good driven shoot is not to be underestimated. One must take real satisfaction not only in the social side – and people involved in shooting tend to be great characters who enjoy the drinks breaks and lunches – but in the beauty of one’s surroundings. This will be brought to life more vividly if you develop your knowledge as a countryman with regard to crops, trees, flora and fauna. I now carry a small camera in my comfortable shooting clobber for occasional use between drives when something in the natural world attracts attention. I love the feeling of having found one’s place in the great creation that is all part of a good day, another form of the connection that is so important to enjoyment and success.